BandScapes has a number of interesting ring designs, including some leaf and twig ring sets which they suggest as wedding bands but seem to me like they could be interesting for other purposes as well, including self-weddings and other rituals. 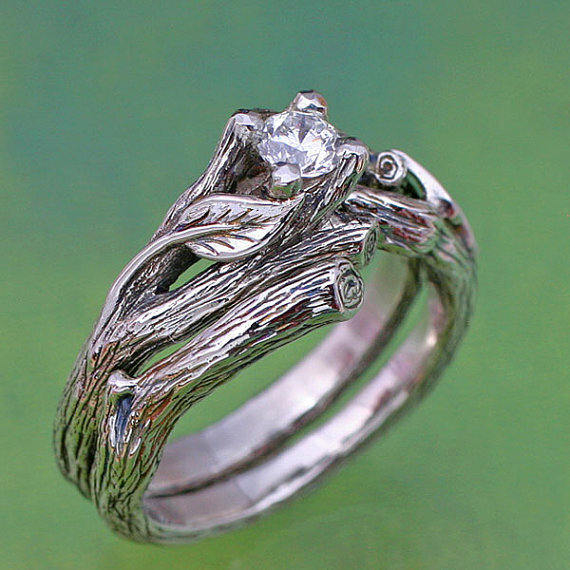 “Nature and elegance combined into a beautiful wedding ring set. 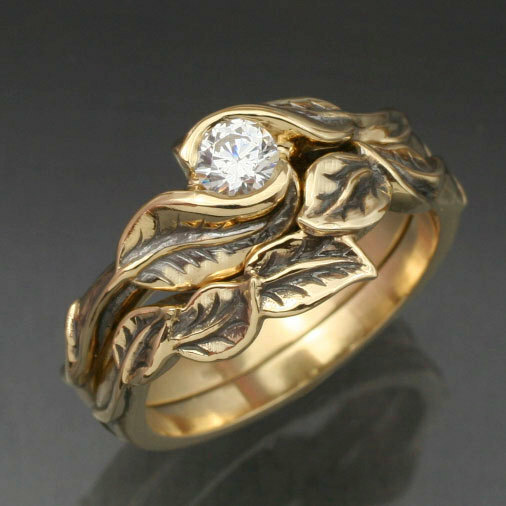 Both rings are branch design with accent leaves and are portrayed with extreme detail. 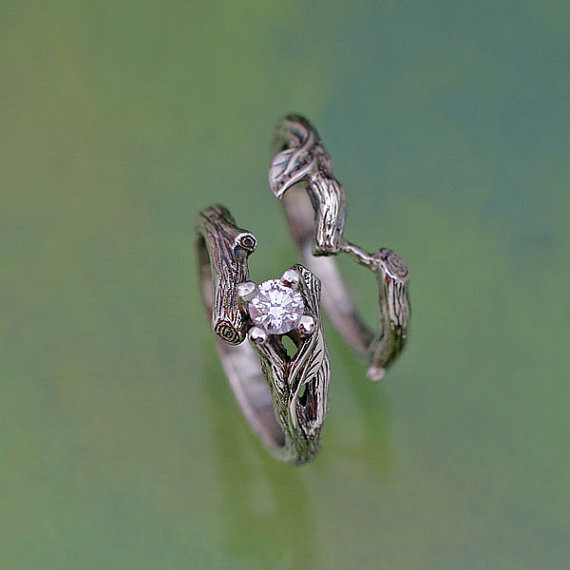 The engagement ring’s branches form a four-prong setting for the stone. The matching wedding band is form-fit and locks to the engagement. You will see in the 4th picture, a tiny bridge between two sections of the wedding ring, that tucks under one branch of the engagement, to hold the two rings together while worn. Set into this ring is a 4mm round, full facet brilliant cut, natural diamond. This is a quarter carat size stone (.25ct.) and I use Ideal Cut stones graded E-F Color and VS-1 Clarity. The prong setting is not too tall, so overall these rings are extremely comfortable to wear. 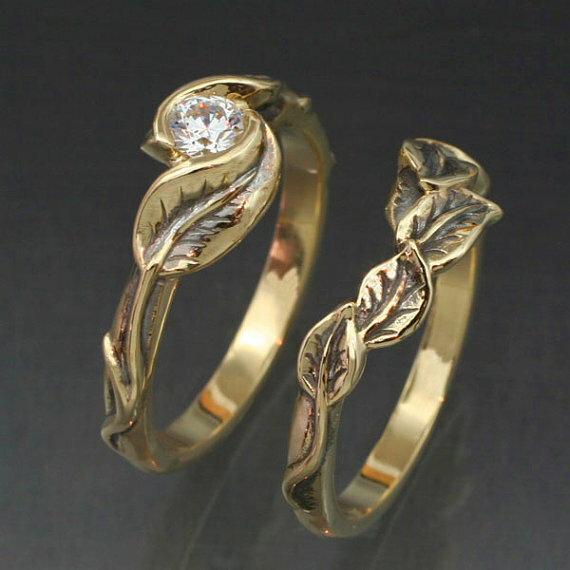 “This is the two ring wedding set of our Delicate Leaf design. The engagement ring has two leaves wrapping a center stone in a graceful manner. It is delicate and elegant. The wedding band matches perfectly with five small leaves that fit tight next to the engagement.